"There are millions of miles of natural gas pipelines located underground across our country. Hitting a pipeline can cause damage and failure of the pipe. And pipeline failures can result in injuries, and even fatalities. That's why all excavators -- whether they work with a shovel or a four-ton backhoe -- must make damage prevention their number one priority. 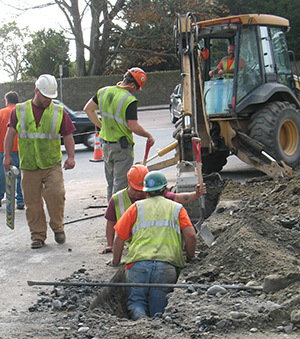 Everyone who excavates or digs must do their part to ensure that underground facilities are located accurately before digging begins. So call before you dig! It's your responsibility, and it's the law." What do the color codes of line markings on streets and sidewalks indicate?